Sometimes it begins with a taste. It entices and sometimes teases. It can be a glimpse of joys yet to come. It can be spicy, it can be hot, but most importantly (at least this time) seduction must be sweet. The theme for this months Sugar High Friday, SHF 28 is Sweet Seduction. This month, I decided to make two desserts. The first, being a dessert to seduce me and the second, to seduce someone else. Both desserts are incredibly easy. 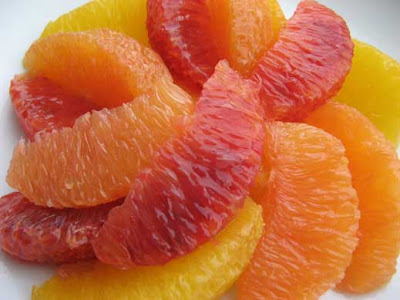 The first dessert is an orange salad made up of blood oranges, cara cara oranges and navel oranges. Pick good quality oranges and segment them. This second picture shows their individual colours which are intense and amazing. Oranges are currently at their peak. Apparently it is easy to seduce me, just give me a fresh simple orange salad. The second dessert is a chocolate creameaux. 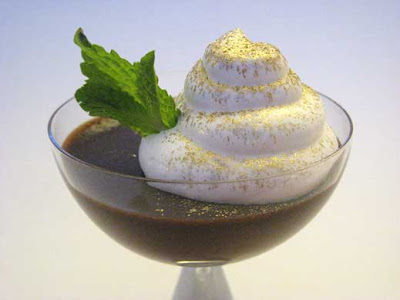 Chocolate creameaux has a wonderful silky mouth feel much like pots de crème, but there is no baking involved. Simply make a cup of crème anglaise and pour it over 100 g. of chopped up dark chocolate. For easier mixing, place the chocolate in a food processor and pour the hot crème anglaise on top. Let the custard melt the chocolate for a few minutes before turning on the food processor. Process or mix the chocolate mixture until it is smooth. Pour into small cups or ramekins and let it set in the refrigerator for an hour before serving. This can be made a day in advance and is incredibly easy. Garnish with whipped cream, chocolate or raspeberries. It is one of those desserts that will impress and seduce just about any chocolate lover. Sadly, this would probably seduce me as well. Posted by Sam at 6:53 p.m.
so easy and beautiful, i must try this-beautiful photos! 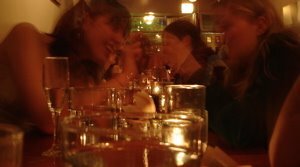 Your orange picture is perfect; lately I've been enamored both with cara cara oranges and pink grapefruit; I've been eating them tossed with endive and either a nice gorgonzola or avocado, drizzled with just a bit of olive oil. I've been day dreaming about citrus...maybe it's something about the winter, where these fruit can be a little reminder of summer, spring?